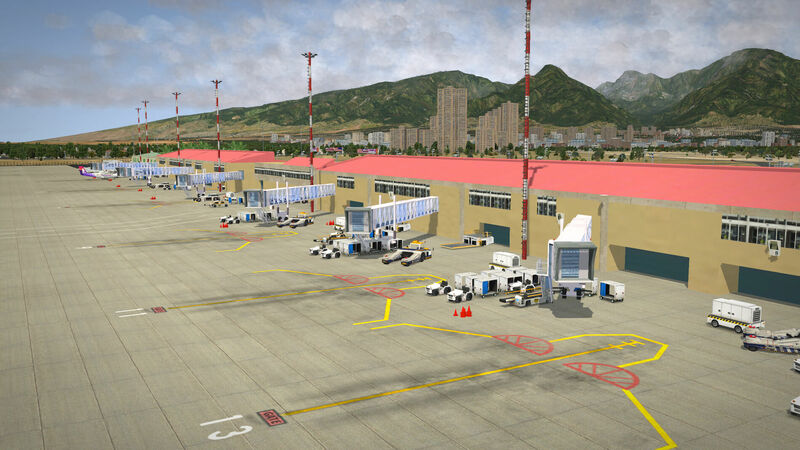 Although these airport impressions from NAPS airports are flown with X-Plane 10, all airports mentioned in this impressions are in the mean time compatible with X-Plane 11. Ok, I hope you enjoyed your time at Kahului. I enjoyed it and I’ve seen many things I would normally never have seen. This intermediate stop is almost over, but before we leave for Hana airport, I’ll check out Kahului International Airport. Why not join me on my walk-around trip at PHOG?. From the real Google Earth picture, it’s clear that the ground textures are colored brown/red. PHOG has two runways (20/02 and 23/05), isn’t as complex as Honolulu, but there’s still a lot to see. Parallel to runway 20/02 is a large taxiway, stretching out from one end of the airport almost to the other side. Along the taxiway you’ll find the passenger terminal with the characteristic salmon red roofs with the commuter terminal behind it on the south side. 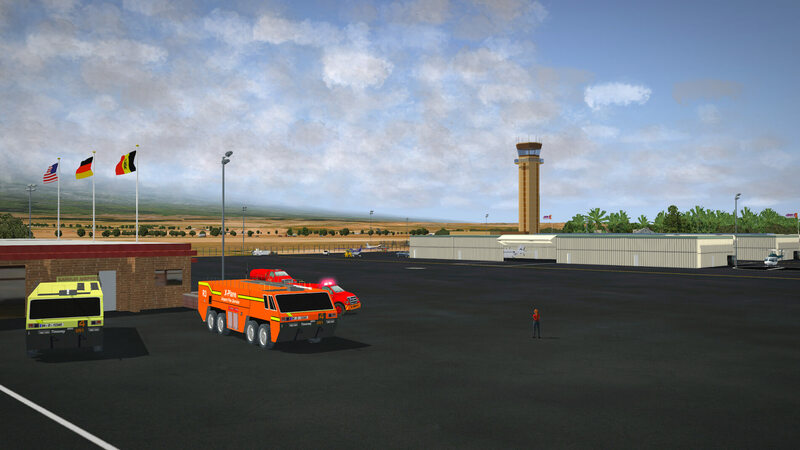 On the other side of runway 20/02 is a cargo apron, helicopter terminal and GA transient parking, the fire station and the control tower. Well, that’s all very interesting, but a little more background information might be welcome. Kahului Airport is a regional airport in the state of Hawaii, USA and is located east of the Kahului CDP in Maui County on the island of Maui near Haleakala. 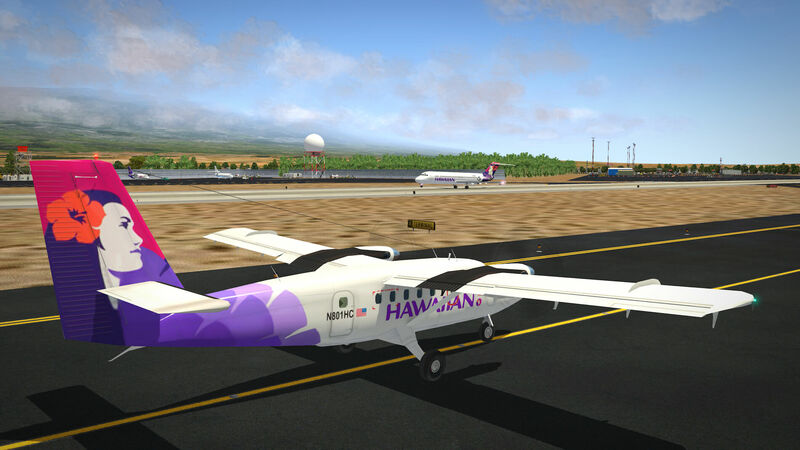 Most flights into Kahului Airport originate from Honolulu International Airport. The Honolulu–Kahului corridor is one of the busiest air routes in the US, ranking 13th in 2004 with 1,632,000 passengers. 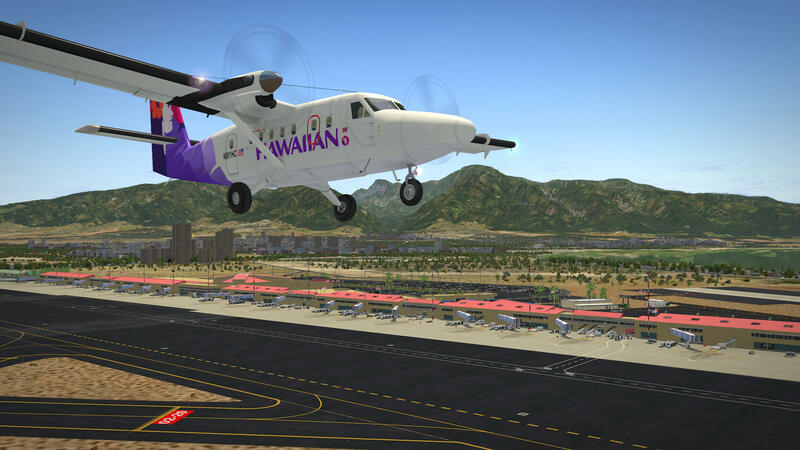 The airport code pays homage to aviation pioneer Bertram J. Hogg who worked for what is now Hawaiian Airlines flying aircraft ranging from eight-passenger Sikorsky S-38 amphibians to Douglas DC-3s and DC-9s into the late 1960s. 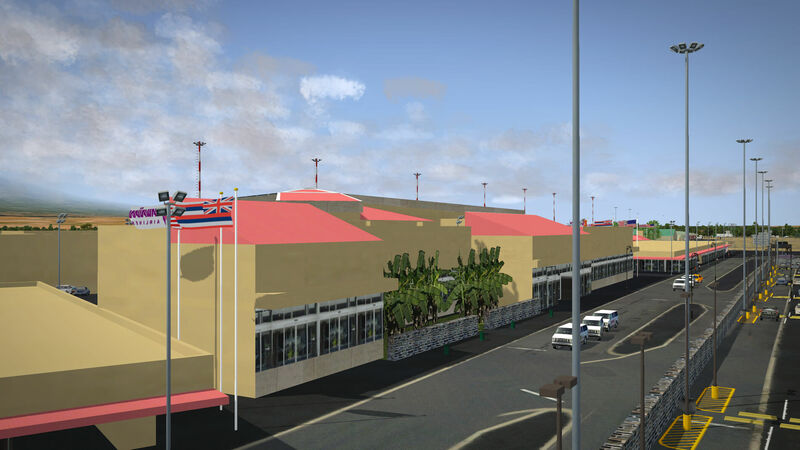 The Kahului Airport terminal building has ticketing, USDA agricultural inspection and baggage claim areas on the ground level. Eighteen jet ways are available and there are six gate hold areas designated A–F with three jet ways each. Gates with odd numbers have jet way systems, while gates with even numbers are designated as emergency exits and have stairs that lead to the tarmac below. Most of the gates were spaced to handle narrow-body aircraft like the Boeing 717 and Boeing 737 used on inter-island flights. In 1982–83, Kahului started receiving nonstop flights from the mainland United States. These flights now use wide-body aircraft like the Boeing 767 and Boeing 777, Boeing 737-700, Boeing 737-800, Boeing 737-900, and Boeing 757. 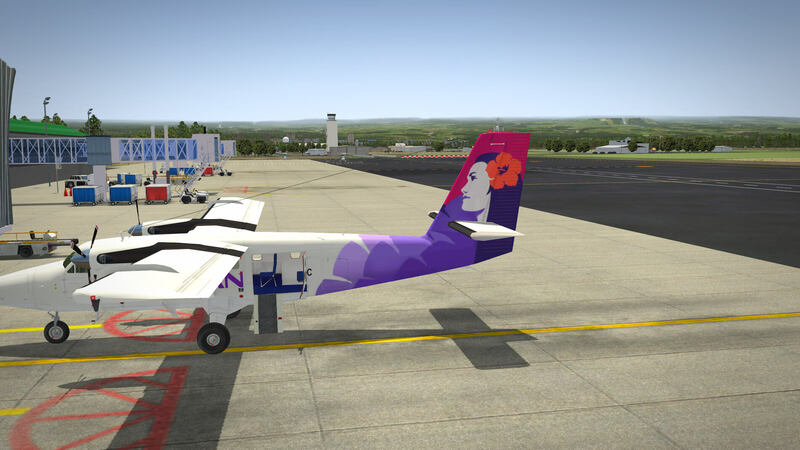 The smaller aircraft used on inter-island flights fit at all gates, while the larger overseas airliners do not. 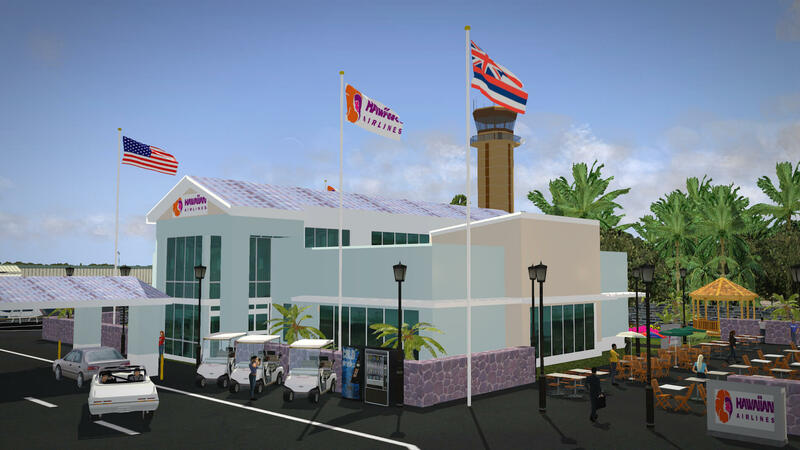 There’s much more to write about Kahului Airport and you can read all about it at the dedicated WikipediA web page. That’s roughly how it looks on the official airport diagram and Google Earth, but how does the modeled NAPS airport look? The modeled PHOG isn’t as complex as Honolulu, but it’s still impressive. I’ve got the idea that the passenger and commuter terminals are handmade. It looks to me as if the ground textures aren’t made with ortho photo real material. Looking more closely, it appears that this is default XP10 ground. On the other hand, default PHOG isn’t really anything. It’s not even worth flying to, but with this NAPS add-on, it’s suddenly a nice spot to be and have a chance to explore the airport. While walking from the commuter terminal to the passenger terminal’s public side, I’m impressed by the completely modeled terminal building. 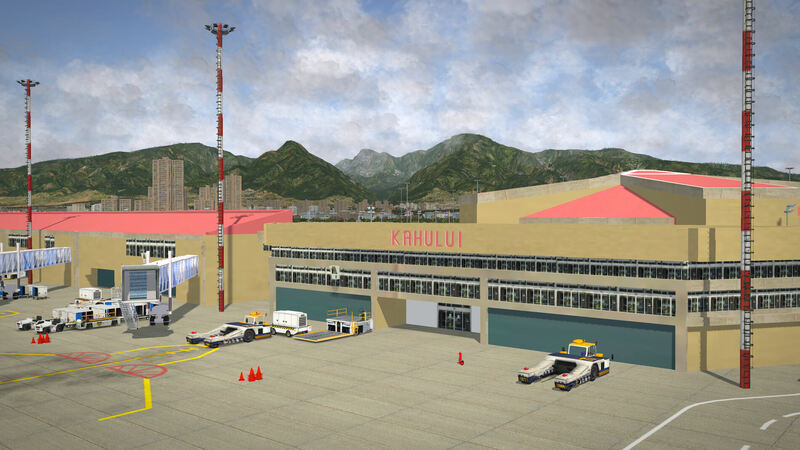 Although the airport is much smaller then Honolulu, it’s still a large and complex terminal and it looks very similar to the real one. Parking at the commuter apron isn’t really a problem. There are only two Cessna 172 aircraft parked and the rest is free for other GA aircraft. Mot of the ground equipment on this small apron is parked on the borders leaving enough space to park your aircraft. Together with the moving flags, it looks quite pleasant. Adjacent to the commuter apron is a huge car parking area. If you think you can park your car here, you’ll find it difficult to find a free place like at most large airports. The parking lots seem to be filled with 3D cars, but a more thorough look tells me that there are some places free. Together with the lighting, an impressive looking area. From the car park, I reach the pubic entrance to the passenger terminal. 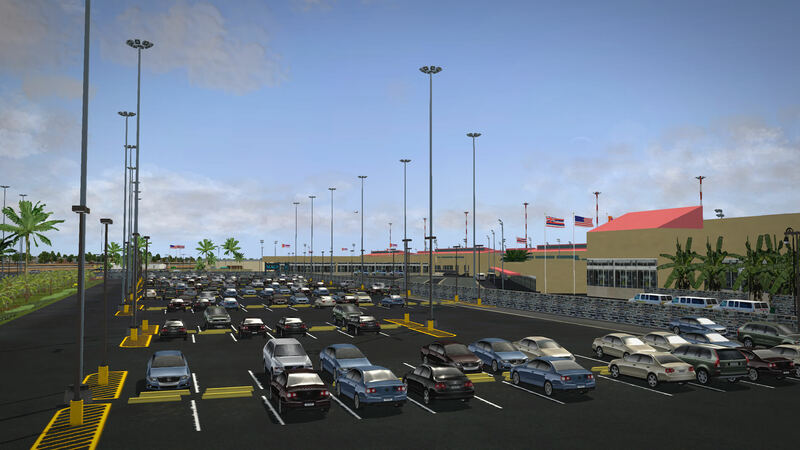 I already mentioned that the passenger terminal is completely handmade and which gives it a very realistic look. On one of the roads in front of the building, I can spot static people, however, whenever a car passed along, it drove through the static people. A patch would be good to reposition these people. Other cars at the public area are of course taxis, car rental buses and hotel courtesy buses. I needed to look twice to count the number of jetways. At first, I thought this terminal isn’t that big, but after I had counted all the jet ways, 18 in total, I’ve come to the conclusion that it’s much bigger then I originally thought. If you decide to land with a medium to large size aircraft, you can take any jet way you want since I haven’t spotted any large static aircraft. But, on the other hand, the apron around the jetways is filled with ground equipment such as baggage belts, carts, stairs, push-back trucks, GPUs (Ground power Unit), hi-loaders and much more. Let’s just say this. Everything that you’d expect to be there is there. You’ll never be lost at PHOG since, as far as I can judge, the ground textures and markings are there as well as the taxiway and runway signs. 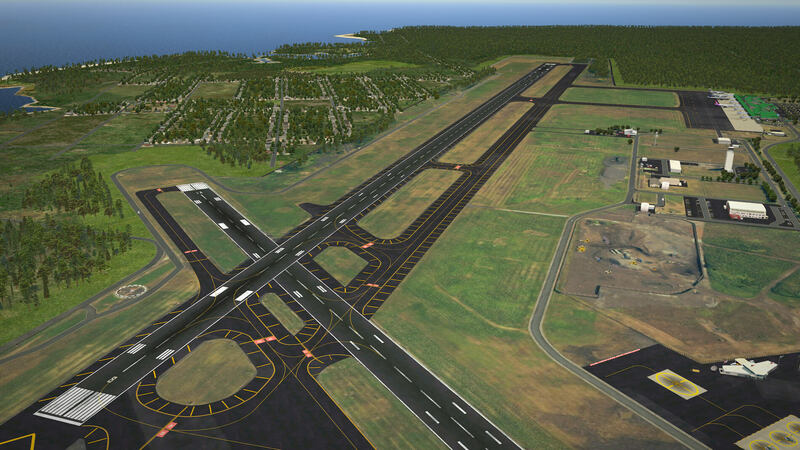 Now, it’s time to have a look on the other side of runway 20/02 to see how these aprons are modeled. The first apron is located near the beginning of runway 02. It’s the helicopter apron with the well-known “Blue Hawaiian Helicopters” company located nearby. You can’t miss it since you’ll find blue flags, blue hangers and, of course, blue colored helicopters. It seems it’s a quite day since most heli spots are occupied with static helicopters. Although it’s a small apron, it’s quite interesting to see how it’s made and how realistic it is. 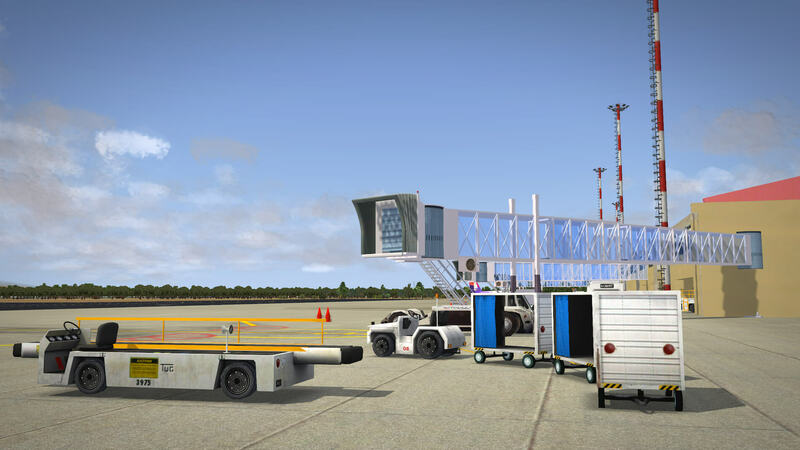 Further on, to make it complete, are the necessary static heli related objects like portable fire extinguishers, heli movers, maintenance cars and much more. Walking around the palm trees and a sound barrier, I reach the other GA apron. 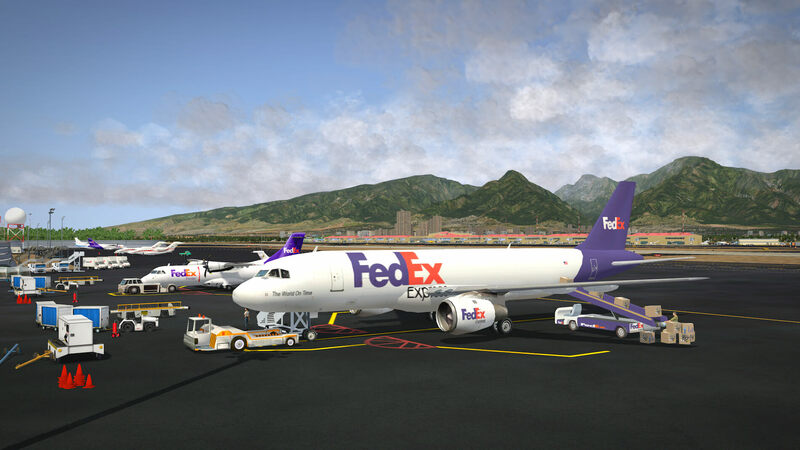 On this apron, which is not as crowded with ground objects as on the other side, you’ll find some static aircraft from different companies like FedEx commuters or privately owned aircraft. The middle of this apron, it seems, is dedicated to cargo aircraft. You won’t find huge hangers here or other big buildings. 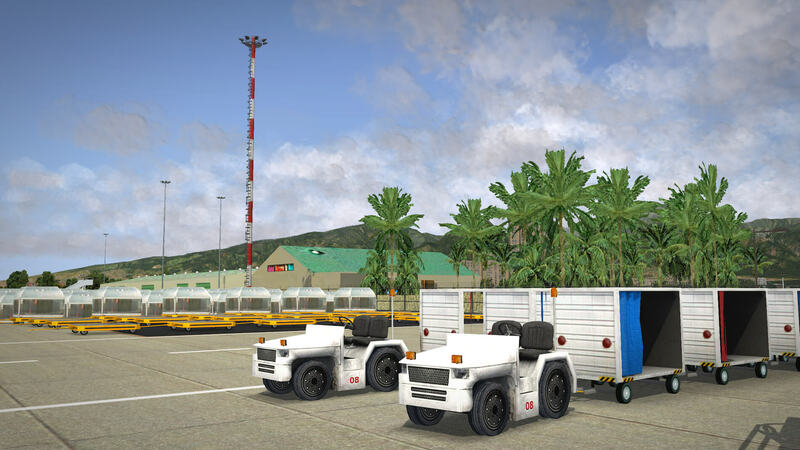 Most of the ground equipment is situated in the open air as are the cargo containers. I’m not sure if these buildings or houses are taken from the Legobrick system, but to me it looks as if I’m walking on a real apron. A little further on I pass the control tower and, I think, an executive terminal. 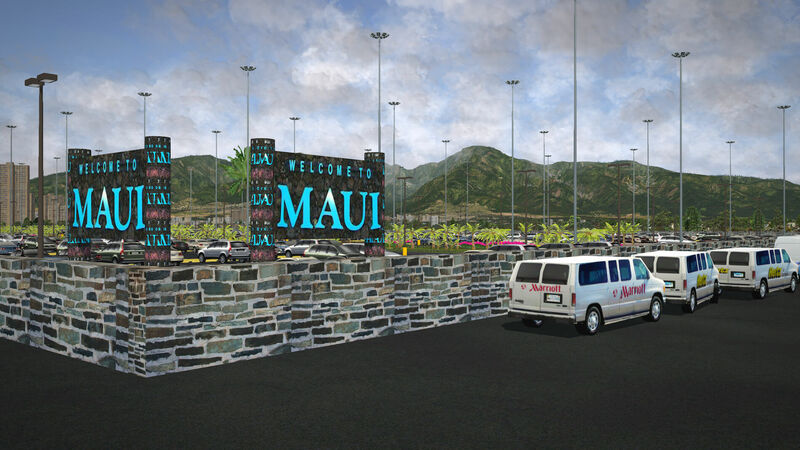 In case you don’t know which island you’re on, the entrance tells you that you’re “Welcome to Maui”. Next to this terminal there’s another GA parking location with some small hangers and at the far end of this apron the fire station. Funny to see that on the fire station I can see an American flag, a variant of the Belgian flag and the German flag. I know that the Belgian flag belongs to Freddy De Pues while the other two flags belong to other NAPS team members. Overall, I’m quite impressed with PHOG. It was worth doing a quick impression while hopping from one island to the other. Perhaps the NAPS team will, when time permits, upgrade the airport with real ground textures such as I’ve seen at Honolulu and Hilo. I hope you’ve got a good impression of this airport. Take another look at the varying screen shots while I enjoy my lunch. From my parking location, the commuter area, it’s a long way to runway 02 for such a small aircraft. But, after takeoff I only have to make a slight right hand turn to the south while following the coastline to Hana Airport (PHHN). 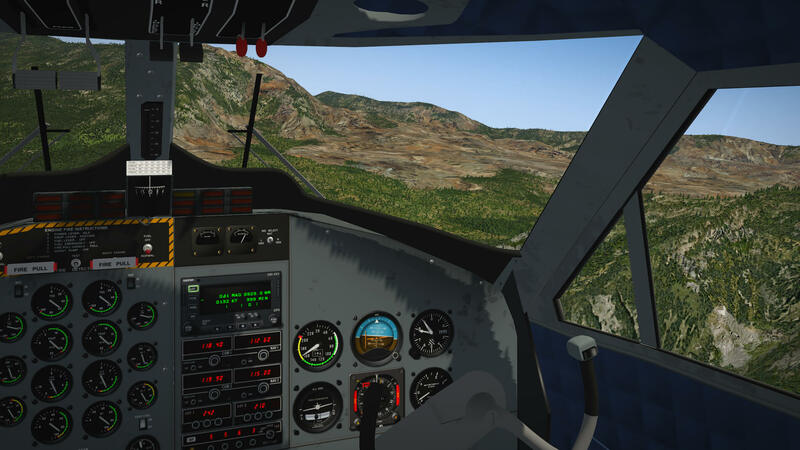 After takeoff, I gradually climb to 6,000 feet, with real weather enabled. The only problem with real weather being active is that you never know what to expect. It could be, in my case, that the cumulus clouds don’t leave much of a ground view. By the way, it was a little bumpy too. Anyway, I’m flying over the city of Haiku and from this point I climb to a maximum altitude of 8,000 feet. I make a slight right hand turn towards the slopes of mount Haleakala. I can’t reach the top because it’s too high and it’s a National Park. A part of this mountain, or at least what’s left of it, is a restricted area. The nice thing about all of this is that from this altitude, I can see Hana Airport in front of me. 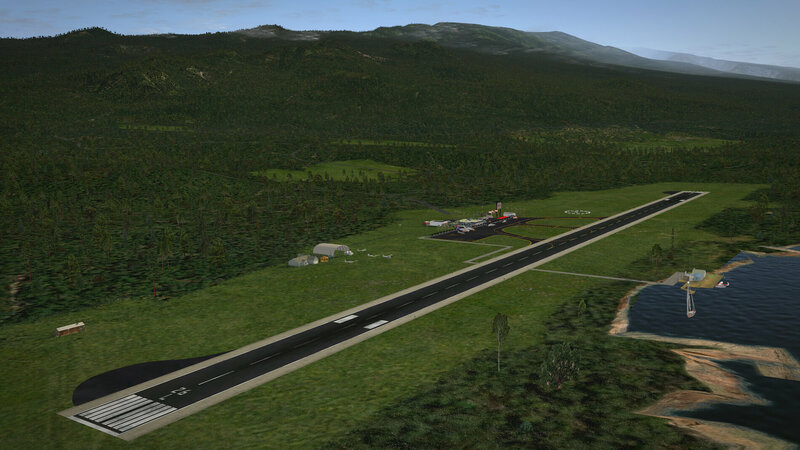 From the mountain slope, I make a steep descent towards Hana city and I’m able to make some screen shots of Hana airport. Making a 180 degree turn brings me to the right final approach for runway 26. From the moment I taxied out from PHOG till the moment I arrived at PHHN, the whole flight only lasted about 25 minutes. If I had followed the coastline, it would probably be even shorter. Now that I’ve seen something of this part of Maui, I’m aware this is a short section and not so much more to tell. Well, except for one thing which is confirmed by VFR charts. I spotted several gliders lying on the grass strip at Hana airport and looking on the above map, you can see many glider symbols. After looking at the area around the mountains, I can imagine that this is a great glider area, even with National Park restrictions. Leaving the runway and following the last taxiway to the apron, there’s not much space left to park my Twin-Otter. Therefore, at the first available place, I stop and shutdown my engines. Welcome to Hana airport. Compared to the other three airports in this flight adventure, Hana airport is very small and besides the only runway 26L/08R, there’s not much more than an apron and a helicopter spot. But wait. 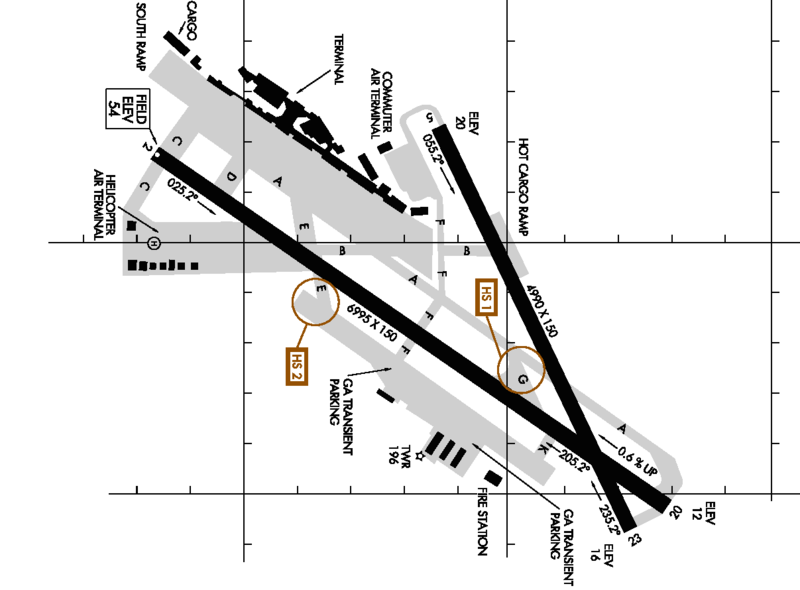 If there’s only one runway, why do they call it 26L/08R? For that you need to check the bay, since there’s where we’ll find the other runway, 26R/08L. Naturally, this is a water strip for float airplanes. 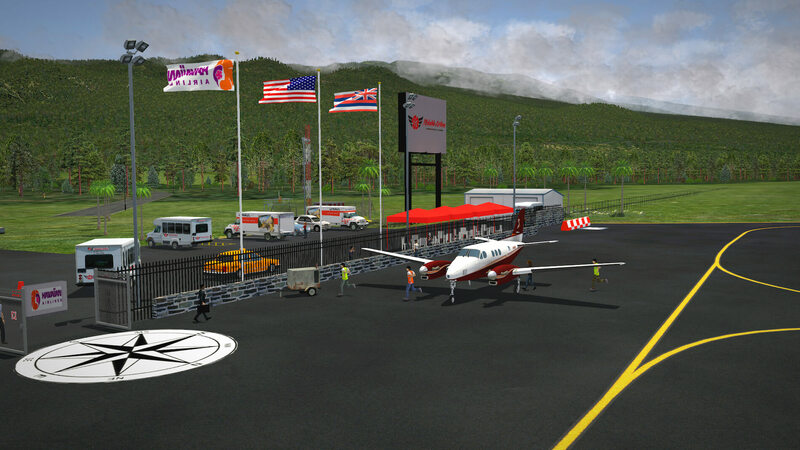 With Freddy’s background information, lets first have a quick look at the real Hana Airport before checking out the modeled Hana. Hana Airport is a regional public use airport of the State of Hawaii on the east shore of the island of Maui, three nautical miles (6 km) northwest of the unincorporated town of Hana. It is primarily a commuter facility used by unscheduled air taxis and general aviation. 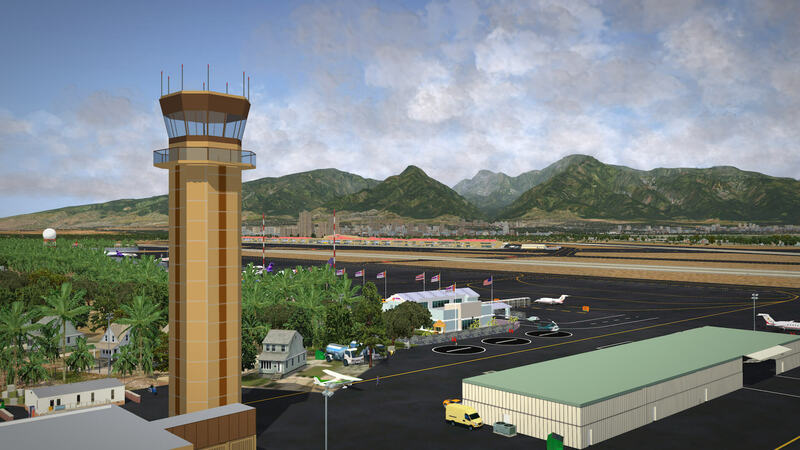 As air traffic increases, the Hawaiian Legislature will consider future improvements including the construction of a taxiway paralleling the runway, widening of access roads and expansion of passenger terminals and parking facilities. 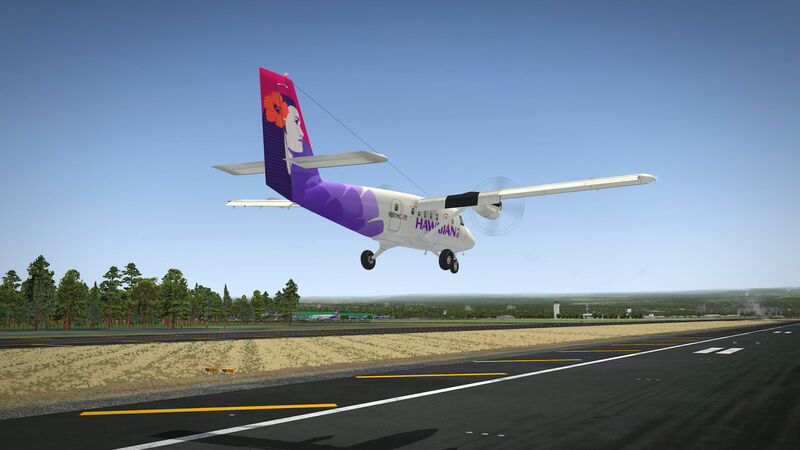 According to U.S. Department of Transportation data, Pacific Wings transported only 375 passengers in the first 10 months of 2012, while Mokulele Airlines claims to have transported 1,706 passengers since October 2012, according to their EAS bid for Kamuela service on May 23, 2013. 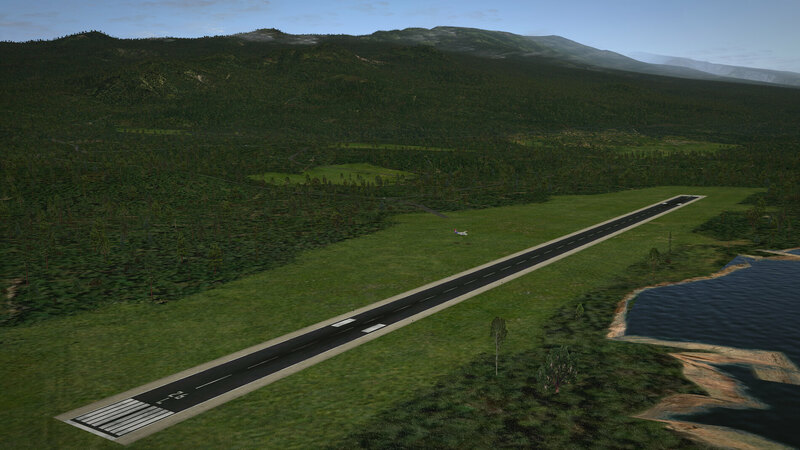 Hana Airport covers an area of 119 acres (48 ha) at an elevation of 78 feet (24 meters) above MSL. 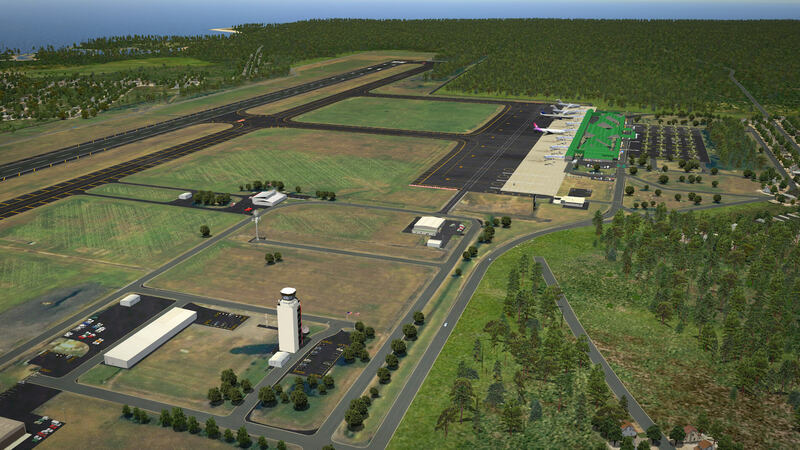 It has one runway designated 8/26 with an asphalt surface measuring 3,606 by 100 feet (1,099 x 30 meters). The above is a small section of what can be found at the WikipediA web page. If you want more information, then check out this WikipediA link. If you check the airport lay-out on AirNav for Hana, you won’t find the airport diagram. That’s simply because there’s not much more then one apron, a couple of GA aircraft parking spots, a small harbor, a small but elegant passenger terminal, a restaurant, a car parking lot, a billboard, some flags and a couple of other items. Although this sounds limited in resources, taxing to the apron and seeing all of this, still gives the airport a realistic and busy look. 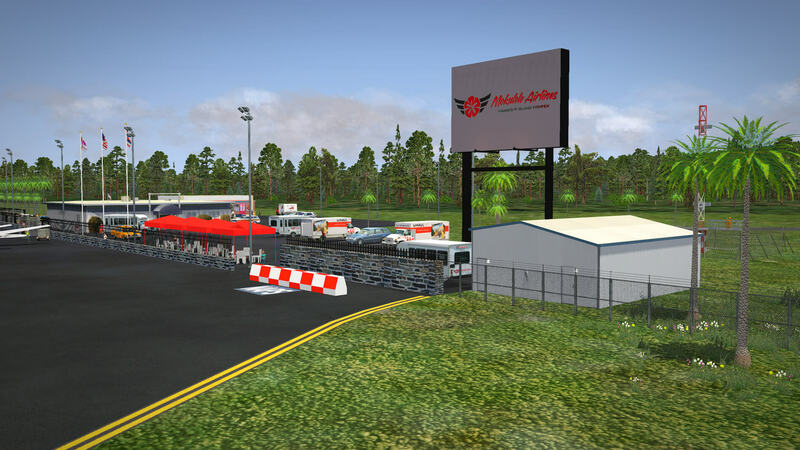 As can be read from the billboard and confirmed on the Internet, the local airline here is Mokulele Airlines which operates with medium size GA twin engine aircraft to serve the Island’s small airfields. 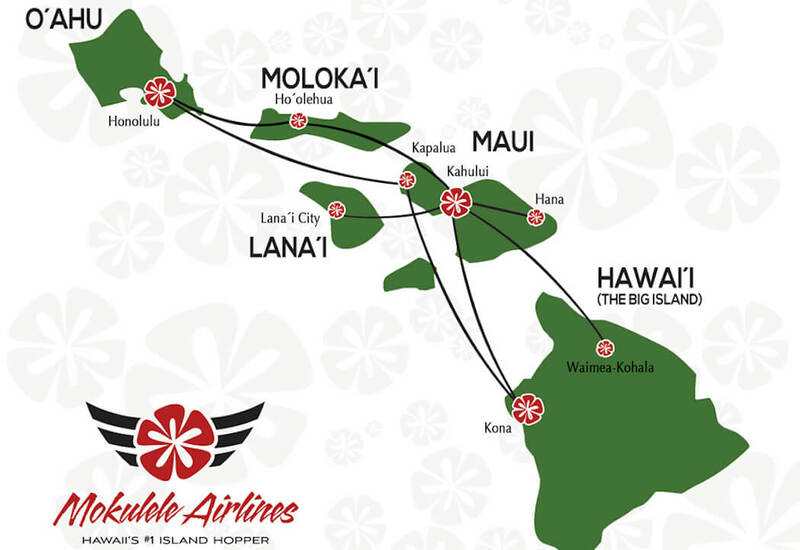 Look below for the map overview of Mokulele Airlines island hopping. 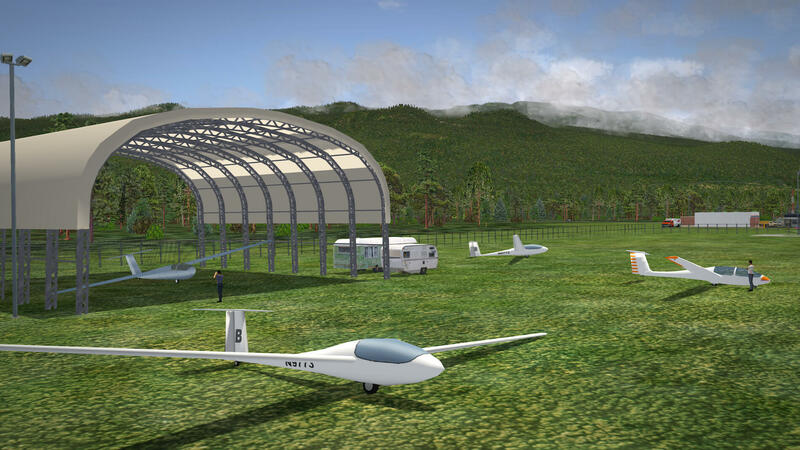 At the beginning of runway 26, there’s a small grass field with a Cessna 172 and some gliders. Looking around at the surrounding Hana area, I can imagine that gliding is a favorite sport here. And of course, our Blue Hawaiian helicopters company is also present on Hana. The only helicopter at this time isn’t a static heli, but every couple of minutes it moves up and down. At the public area, there’s a small car parking location with not only a passenger terminal, but also a 7 Eleven store. If I’d forgotten something for my next long flight to Hilo International Airport, I could get it there. 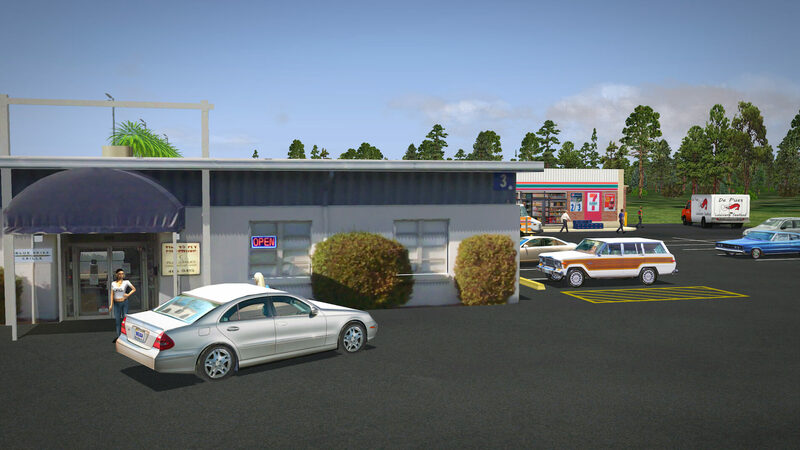 If you really want to eat something before moving on, I can suggest visiting the “Blue Skies Grille” restaurant which has a side entrance at the terminal building. The only problem I found is the road towards the airfield. This stops about 30 feet (10 meters) before the airport’s car parking area. Perhaps a small update to solve this? 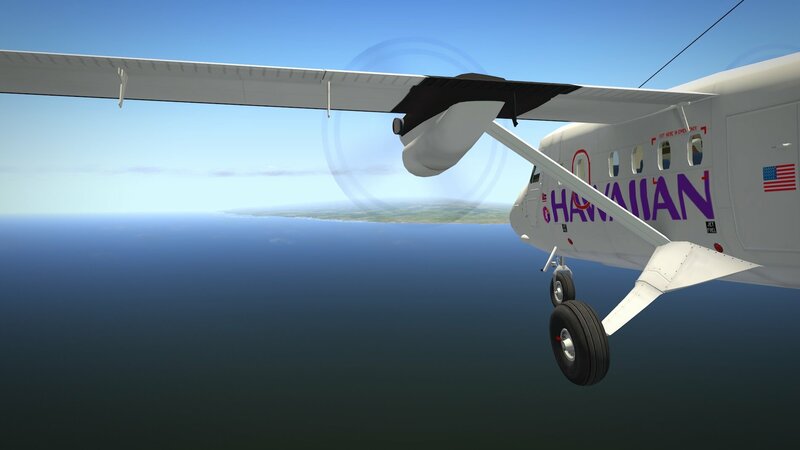 Hana Airport, I personally would call it an airfield, is still worth visiting. 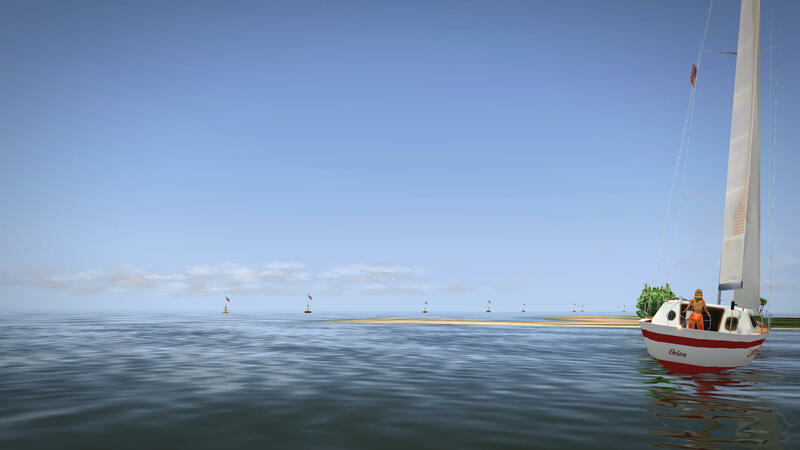 Everything is added to the default XP10 scenery as can be seen on the following screen shots. The upper screen shot shows you the default Hana XP10, the lower screen shot the NAPS/Fred-E.Net Hana version. Besides having my doubts about the additional water runway and the small harbor, it’s always much better then having only one runway and nothing more! Overall, a nice and interesting Hana experience. Since there’s no parallel taxiway, the only thing you can do is taxi on the runway and at the end, making a full 180 degree turn. Strange? Not really. There are many small airports in the world where the runway is also used as a taxiway. Anyway, I takeoff from 08, climb out straight to 6,000 feet and turn right to an approximate heading of 150 degrees. In my case it was 150, but if you try the same flight adventure, it could be slightly different. The reason for that “approximate” is because I turned on the Garmin GNS 430 waypoint (fix) PULPS. This waypoint lies more or less in the middle between Maui and my last island, the Big Island of Hawaii and is known as the Maui Channel. 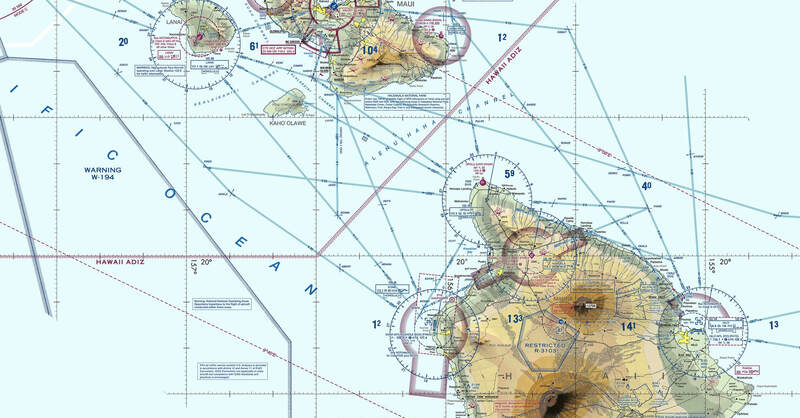 At 5 NM before you’ve reached PULPS, you can tune any other fix or VORTAC (UPP – 112.30) or you can select straight away fix EKAGE (lies near the Hilo airport on land) or EREBE (lies above sea but in-line with runway 26.) But, you could question, “is there really a need to tune after fix PULPS another waypoint?” The answer is simple … No! 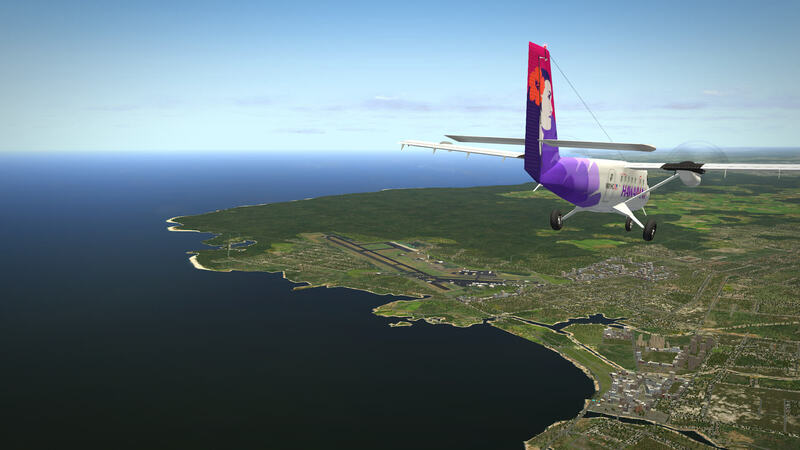 Once you’ve reached fix PULPS, you can already see the island and if you fly along the east coastline toward Hilo airport, you can’t miss Hilo and the airport, which is slightly north of the city. The only advantage is that when you’ve tuned either EKAGE or EREBE, you can monitor the actual distance to Hilo. So, as usual, it’s up to you! While flying at an altitude of 6,000 feet along the east coastline in the direction of Hilo, honestly, the landscape isn’t really spectacular. You can’t miss Mauna Kea, part of the Mauna Kea Ice Age Natural Area Reserve, but further on, there’s nothing special till you reach Hilo. 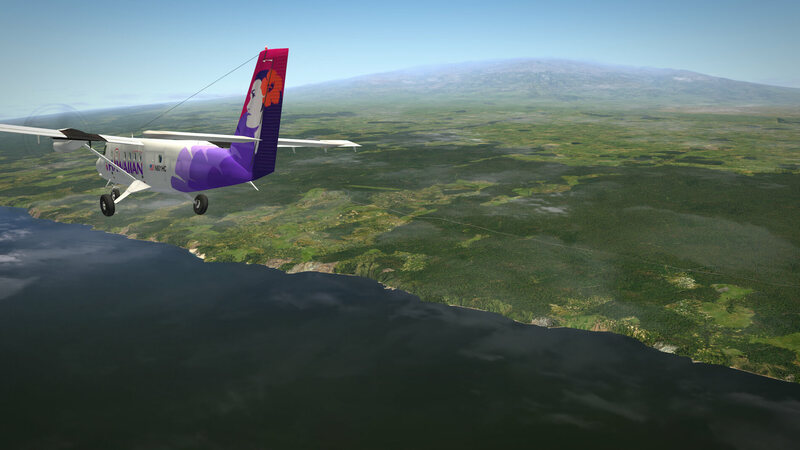 At the altitude we’re flying, Hilo is quickly visible, but where’s the airport. 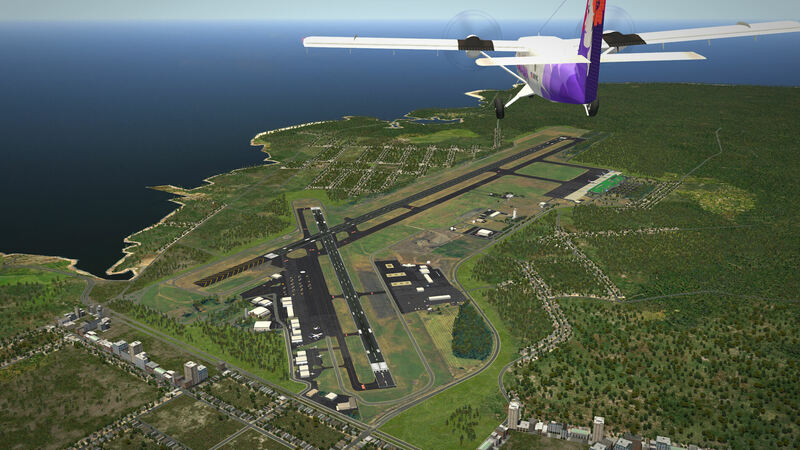 Although I’ve previously reviewed the Hilo airport, more about that later, spotting the airport isn’t easy. 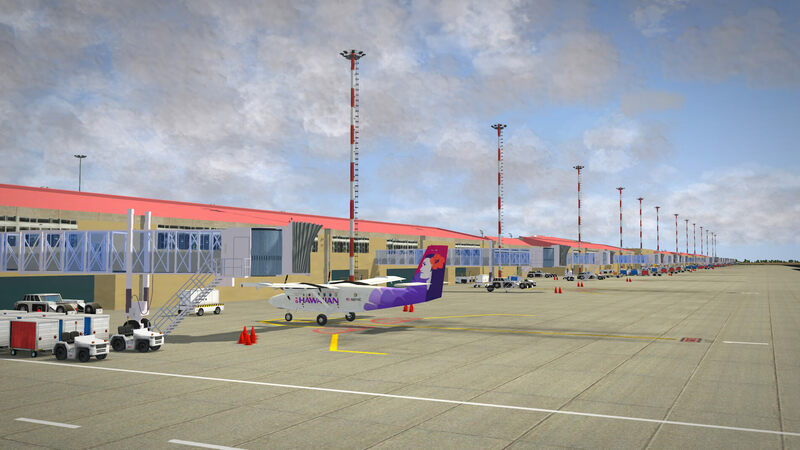 The main reason is that the airport does have ortho ground textures included and therefore, it blends perfectly with the surrounding area. When you have a top down view using Google Earth on Hilo airport, you won’t see much difference of the airport ground textures and those of the modeled NAPS Hilo. In other words, it’s good looking and exactly how it should look! Not strange that I use those words since I mentioned this in the Hilo airport review. While I’m approaching the airport and starting descending, I fly once over the airport and make some “top-down” screen shots. See the result below. After I enjoy the “to touchdown” view myself, I’ll try to pick up my EREBE waypoint and from there a nice turn for my final approach to runway 26 Hilo Airport. I have a special one time permission to park the AeroPedro Twin-Otter at one of the jet ways of the main passenger terminal. Am I surprised about this airport and how it’s modeled? Not at all. Remember, I’ve reviewed this interesting NAPS airport before. I still remember the words I used, “an impressive freeware XP10 only airport from NAPS/Fred-E.Net”. What else can I say? 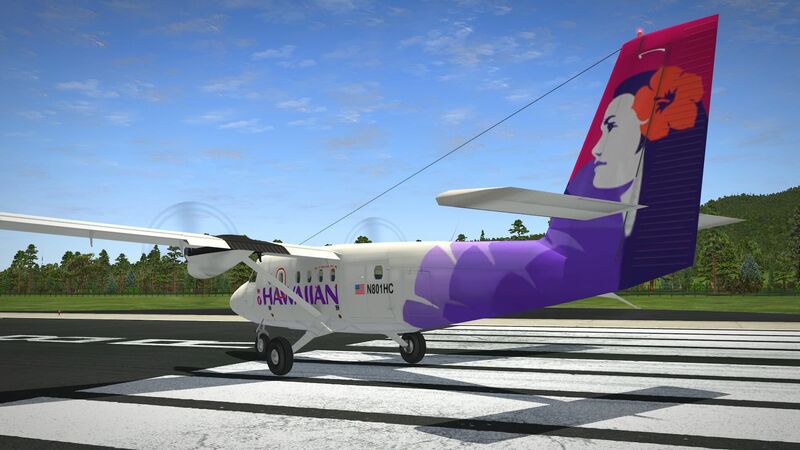 Perhaps this … average flying time from Hana to Hilo is somewhere between 45 and 60 minutes. It all depends on your speed and if you want to indulge in some sightseeing. I made it, but I covered only 4 NAPS/Fred-E.Net airports, but the NAPS team offers a lot more. To be exact, a total of 14 including these 4 airports! So if you really want to, you can install them all and make your own flight adventure with 13 hops. 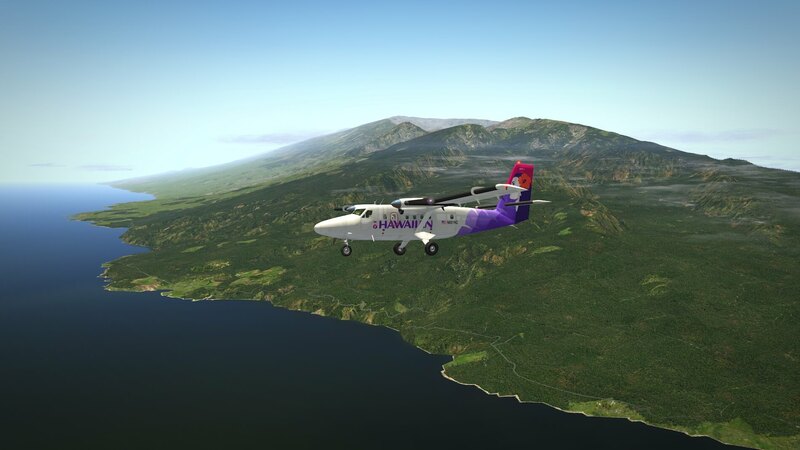 I decided to fly this adventure with the AeroPedro Twin-Otter version 2.2. 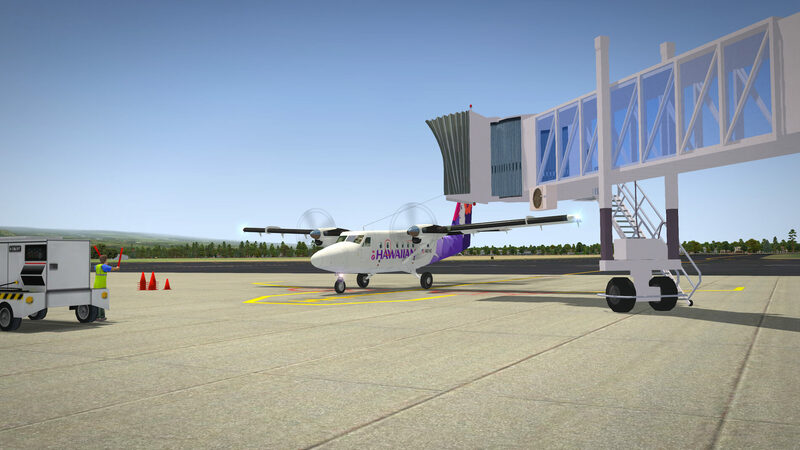 I could have used the McPhat /Aerosoft ATR72, but that’s payware and perhaps not everybody has this aircraft. 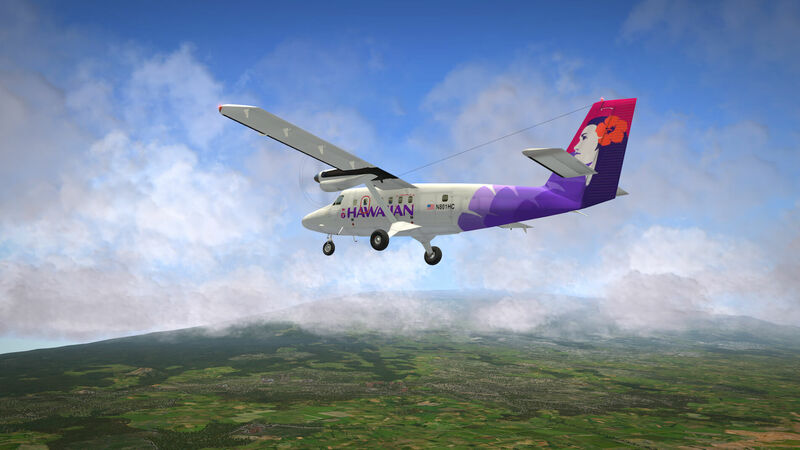 If you want to fly this adventure yourself and use the McPhat/Aerosoft ATR, then I suggest you install the Ohana livery painted by Eport. You can grab this livery, as part of a package, by using this Eport link. Was it worth doing this combination flight adventure review/impression? It was really fun. I had the time to fly and to relax. True, the review/impression is quite long and covers over more then 6,500 words. Despite it’s length, it was really fun and hopefully I made you enthusiastic enough to try it yourself. I would like to thank a few people. In particular, I’d like to thank Freddy De Pues and his Fred-E.Net website (https://fred-e.net) and of course, all the other NAPS team members who are responsible for these freeware airports. 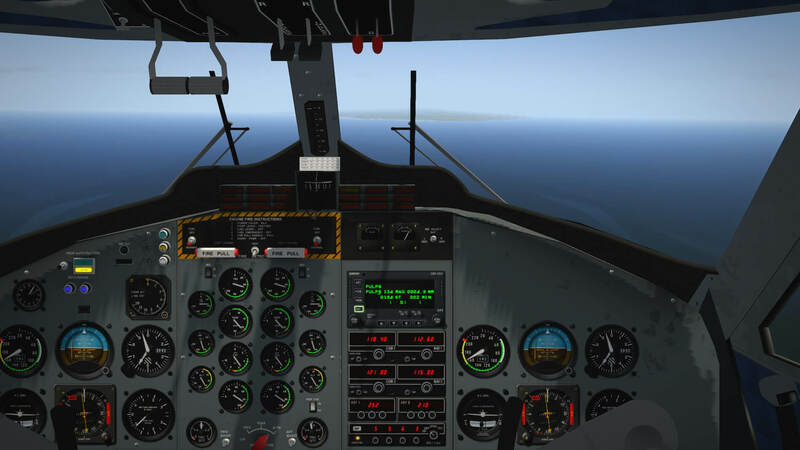 Also, a special thank you for Antonio, also known as X-Plane.Org user AFNavarro. 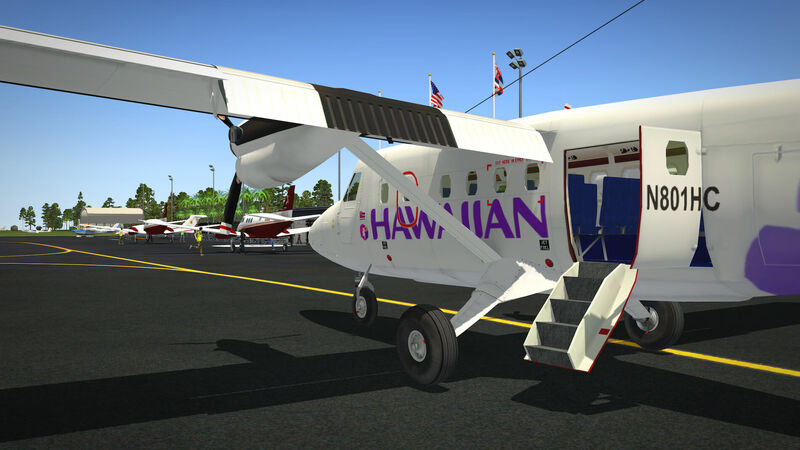 He painted the Hawaiian Airlines, for me exclusively, the AeroPedro Twin-Otter DHC6-300 Series version 2.2. Many thanks Antonio for doing this for me! If you have any questions or comments about this Hawaiian flight adventure, feel free to contact me at Angelique.van.Campen@gmail.com. Software Source / Size: Download / N.A.